As everyone in Dryden no doubt noticed, there was a lot of rain in October - 7.27 inches, up from the usual 3.26. All the rain we didn't get this summer apparently fell over the last few weeks. 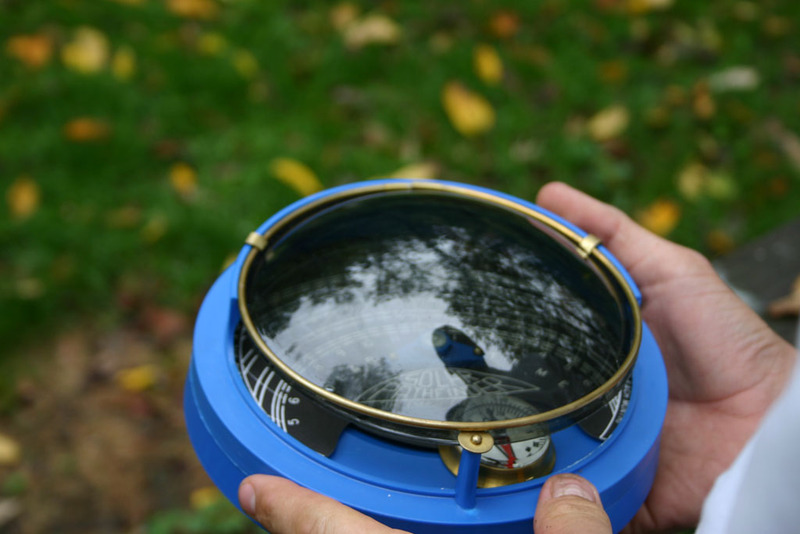 It could be worse - New York's Central Park got 16.73 inches! Their organization includes one Democrat, the treasurer, who Tom claims will be more visible in the next week, but hasn't previously been involved in local politics. Every single candidate the Coalition for Change endorsed is a Republican. Apparently content with the status quo in at least one instance, Hatfield announced their endorsement of incumbent District Attorney George Dentes. I have to admit I'm disappointed. 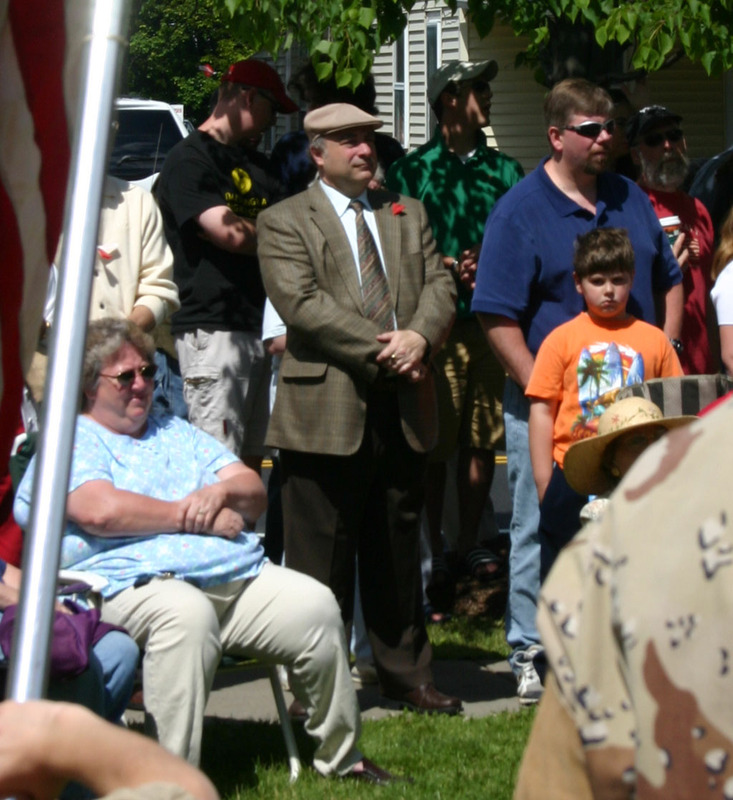 Early on, I'd heard that Tom Hatfield was doing this in part to get away from the right wing of his own party, and to maybe work with some Democrats, possibly Town Supervisors with different perspectives than the county, or rural Democrats who don't always get along with Ithaca Democrats. I've heard nothing about that since. Instead, we seem to have a straight Republican ticket by another name, with a Democratic treasurer. Tom did talk about separating local politics from national politics. This seems to be much more about changing the name on the ballot than about changing politics as usual. I always find it strange that local politics is frequently so, well, local. At least when it's convenient for someone's argument, they don't look beyond the borders of their own municipal unit to see if anyone else is sharing the same pain they are. In county races this year, the Republican message is frequently that Democrats raised your taxes, and any complaining about state mandates, pensions, or Medicare is just a lot of excuses. Unfortunately for them, even a quick glance at numbers from across the state demonstrates that 2000-2005 was an incredibly difficult for pretty much every county. County Legislator Mike Lane asked the County Administrator's office for some charts showing how taxes have looked in similar and adjacent counties, and presented it to the Town Board at their September meeting. What do we find? Tompkins County's recent budget struggles are very ordinary, hardly different from surrounding and similar counties. If that chart's too small to see, click on it for a PDF version (105KB) with more numbers, or you can explore the original spreadsheet (100KB Excel file). 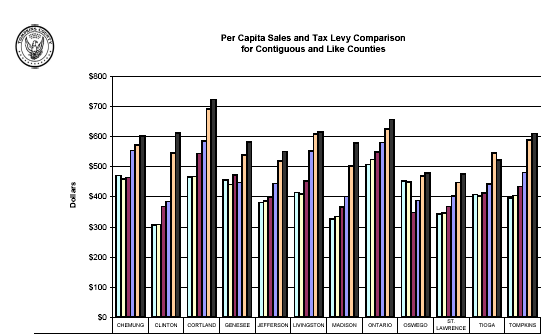 I've even added a % change column to the tax levy per capita data, which shows Tompkins County to be boringly average. There are some counties that held on better than others, sure. Oswego County seems to have started this cycle with a big tax break I don't know how to explain, leaving them with a 6% increase. Otherwise, the best performers had 28% increases and the worst 99%. 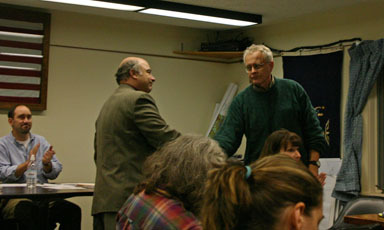 Tompkins increased 55%, while Cortland climbed 56%. These aren't numbers that you're going to hear in the Republican (or the Coalition for Change) ads or on the radio from Republican candidates. They'd really prefer voters to think that Tompkins County has a government unique for its tax increases. Under the Democrats, the county property tax levy has grown from $16,722,397 to $33,103,414, 98 percent in 12 years. Under Republican leadership, the tax levy grew almost three times as fast: from $4,476,257 to $16,722,397, 273 percent in 12 years. Moreover, if increases in sales tax and solid waste fees in 1992-93 had been put on the property tax, the story gets even more lopsided, with the Republicans' total increase rising to an appalling 463 percent. This morning's Ithaca Journal features Hall Pass, a group of Dryden teachers who play jazz together. If you want to hear them, they have a "semi-official gig on the second Friday of the month at the Dryden Hotel." The rest of the Dryden-relevant news is mostly politics. There's a piece on the 13th District legislative race, pitting incumbent Democrat Martha Robertson against Republican W. David Restey. The article talks with both candidates. On the opinion page, the Journal has another head-to-head on the District Attorney's race between Democratic challenger Gwen Wilkinson and Republican incumbent George Dentes, this time on issues of domestic violence. Today's Ithaca Journal has lots of politics, including lots of Dryden politics. The Town Board race gets a meet-the-candidates article, and there's an article on the 14th district legislature race, but unfortunately the profiles of County Legislator Mike Lane and challenger Mike Hattery aren't online. The opinion pages have the last day of letters on local elections, though they published a large number - including my own letter - only online in a large list, so I can't point to specific letters there. This is incredibly frustrating, as there are letters there from Dryden residents supporting (and sometimes opposing) practically every candidate out there. My own letter is the second from last. The only Dryden letter which gets print space (last) and its own page comes from Republican Village of Dryden Mayor Reba Taylor, endorsing Mike Hattery. There's also a letter from Town of Ithaca resident Thomas Pine supporting W. David Restey for the 13th district legislative race. The decision before Tompkins County voters is an enormous one. The District Attorney's office is the people's representative at the heart of the most essential function of government. Putting aside the hollow distractions of the campaign trail, the decision hinges on the value every individual voter places on these essential and often competing criminal justice needs - and how each feels they can be addressed by two distinctly different candidates. In the end, that is a complex and subtle calculus, and one we will not presume to make for you. Local elections matter. In my work on the Dryden Zoning Board of Appeals, I have seen how local decisions can have an immediate impact on how people live. State and federal decisions may take years to have a local impact. It all starts locally. I have spent the greater part of my career obtaining, developing, and honing the many skills that make me a success at what I do. I am now at a time in my life where I would like to apply these skills in a capacity that will help my town. As the director of instructional and informational technology at Newfield Central Schools, I need to furnish the same services as large districts but with less staff and less money. To accomplish this, I've used skills such as data-driven decision-making, creating and adhering to a budget, doing more with less, inventiveness and compromise. These skills could easily benefit the Dryden Town Board. I've lived in Dryden for more than 30 years and my children graduated from Dryden High School. I've been attending planning board and town board meetings for more than a year to learn more about Dryden issues. I have more than 10 years of experience as financial manager of two local not-for-profit organizations. I'm retired now, and I want to put my experience to work for the Town of Dryden. Local government affects our lives in very real ways, from the pothole you curse on the way to work, to the view from your front window, to the response time of emergency services. I will work to make it easier for Dryden residents to be aware of decisions that will affect them and to voice their concerns. Please vote on Nov. 8 and support my effort to represent you. "Based on this, I think we have to look at the policy in total... I, personally as one member of the IDA, will have a problem supporting a school tax abatement" in the aftermath. Amendment to Articles IV and VII of the Constitution, in relation to the submission of the budget to the Legislature by the Governor. The proposed amendment to Articles IV and VII of the Constitution would change the process for enactment of the state budget by (a) providing for a contingency budget if the Legislature does not act on the Governor's appropriation bills before the start of the fiscal year; (b) placing limits on the amount of spending during such contingency period; (c) once such contingency period begins, eliminating the requirement that the Legislature act on the Governor's proposed appropriation bills, and instead authorizing the Legislature to end the contingency period by adopting a multiple appropriation bill making changes to the contingency budget, subject to line item veto by the Governor; and (d) authorizing the Legislature, subject to veto by the Governor, to modify the spending limits for future contingency budgets, except that such changes cannot take effect until three years after enactment. The proposed amendment also sets forth certain requirements for the operation of a fiscal stabilization reserve fund, from which money could be disbursed in a subsequent year. It would require estimates and information provided by state departments to the Governor for use in preparing the budget to be available to the public. It would provide a date certain by which the Governor must submit a budget and appropriation bills to the Legislature. It would reduce the time the Governor has to make changes to the budget and appropriation bills submitted to the Legislature without the Legislature's consent from thirty days to twenty-one days. Shall the proposed amendment be approved? An independent budget office that could publish budget numbers without political pressure - though its leaders would be appointed by the Assembly and Senate leaders. I could happily support any of those proposals, but I still oppose the proposition as a whole. Why? Because those details aren't the core of the proposition, nor are they the reason this amendment is being offered. This amendment is being offered because the legislature lost a court battle with the governor's office about how the budget process runs, and the court decided that the budget process Governor Al Smith wooed voters into supporting in 1927 should operate as written. That gives the governor a lot of power to make changes - more than in most states - and basically the legislature wants that power on their side of the capitol. Normally, I'm not a big fan of handing major powers to the executive. I vastly prefer divisions of power. However, New York State government is not a normal case, and the only player among the "three men in a room" that changes party control even somewhat regularly is the governor's office. The legislature has gerrymandered its districts severely to ensure that they don't fall out of power, though how long the Senate can fight changing demographics is a tough question. Despite cries earlier this year that the court decision would lead to a more prolonged stalemate, the budget mysteriously passed more or less on time. It's hard to argue that the decision caused a crisis when a key sign of dysfunction vanished insted. My hope next year is that next year will see New York elect Eliot Spitzer as governor. Given his tough stances on fiscal transparency and accountability, and the general lack of such things from the legislature, I'd rather leave the power with the governor for now. Even if it's not Spitzer, I still think there's more of an opportunity for the state to leave this power with the governor as we approach what will be a contested election year. S.1 gets at this dilemma in a roundabout way that would create an even messier budget process than we now have. S. 1 does not limit the Governor's ability to include changes in permanent law in his appropriations bills nor does it authorize the Legislature to make changes in such submissions. It only increases the Legislature's relative power in the budget process by taking the Governor's appropriations bills off the table if they are not all acted on by the start of the state fiscal year and giving the Legislature greater discretion in amending the "contingency budget" that would take effect in such a situation than it has in amending the appropriations bills submitted by the Governor in conjunction with his Executive Budget. But neither S.1, nor the accompanying implementing legislation (S. 2., which was enacted over the Governor's veto language and which will take effect if the amendments to the Constitution proposed by S. 1 are approved by the state), assign responsibility to anyone for preparing the "contingency budget," let alone in a timely fashion. Moreover, S. 1 has internally inconsistent language regarding the contingency budget - referring to it in one sentence as being based on the prior year's appropriations and in another sentence as being based on the prior year's disbursements. And, S. 2 makes the situation even less clear. S. 1., as explained in this memorandum, is flawed in significant and substantial ways. Given the state of New York politics today, I don't see how the supporters of this proposition can call it reform. I'll be voting against it, and I urge everyone else to vote against it. 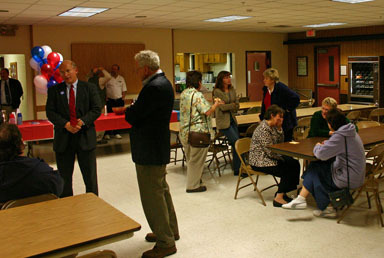 The Republican Meet-The-Candidates event advertised in The Shopper the past couple of weeks didn't look all that different from the Democratic event, except that the Republicans had balloons and cookies from Googer's. (Not my favorite Googer's half moon cookies, but still delicious.) The Republican Town Board candidates came to the Democratic event, and Democratic Town Board candidate Mary Ann Sumner and I dropped in tonight. County Legislature candidate Mike Hattery listens to District Attorney Dentes. 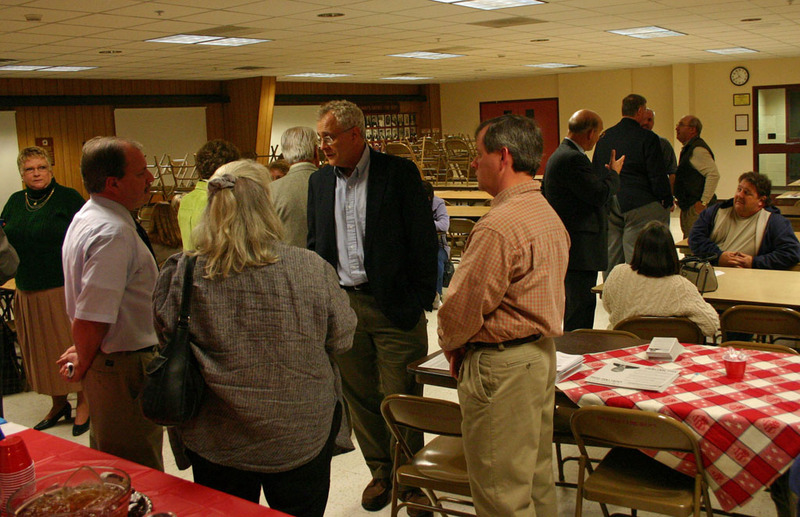 The Republican candidates included District Attorney George Dentes, County Legislature candidates Dave Restey and Mike Hattery, Town Supervisor Steve Trumbull, and, running for Town Board, incumbent Steve Stelick and newcomer Dan Tier. Candidates and the public talk. I did talk briefly with Town Republican Chair Tom Hatfield about the need to do something with all of the candidates together. The League of Women Voters didn't seem to be doing anything like they have in the past with the town races. We'll see what we have to offer two years from now, but hopefully it'll draw more interest than either of these party-sponsored events, fun though they were. To promote and assure the preservation, renewal and improvement of the state's roads and bridges; subways, trains and buses; waterways and airports; and other vital transportation systems, facilities and equipment for the benefit of the people of the state, shall section one of part I of chapter 60 of the laws of two thousand five, enacting and constituting the "REBUILD AND RENEW NEW YORK TRANSPORTATION BOND ACT OF 2005" authorizing the creation of a state debt in the amount of two billion nine hundred million dollars ($2,900,000,000) for the construction, improvement, reconditioning and preservation of transportation systems and facilities, including the acquisition of equipment, be approved? This Bond Act project will support the purchase of four clean fuel hybrid-electric buses for the Tompkins Consolidated Area Transit to be allocated throughout the City of Ithaca and Tompkins County. Statewide, this initiative will provide up to 250 alternative fuel buses to communities across New York State, helping to reduce emissions, enhance air quality, and increase bus fuel economy and bus component life. The rest of the 250 buses seem to be dispersed carefully to ensure that every county gets something. I like the projects generally and some of them, especially those in Steuben County, are things I've wanted to see for a long time. New York already is the second-most indebted state in the nation, behind California. State debt now stands at about $48 billion. And that doesn't include $78.7 billion borrowed by 18 of New York's largest public authorities for their own purposes. The state comptroller estimates that by 2010, taxpayers will be spending nearly $6 billion a year just to pay off debt. Large capital projects are routinely bonded, but I don't see anything here likely to repeat, say, the Erie Canal's ability to pay itself off and then a lot more. Instead, this seems to be deferred taxation, with interest. Today's politicians can get credit for the projects, while tomorrow's politicians will have to explain to taxpayers again why they have to pay it off. As the Albany Times-Union reminds us, Rockefeller was elected on the slogan "Pay As You Go". It's time for New York State to get back to what Rockefeller said, not what he did. Yesterday's Ithaca Journal gave county candidates one last chance to get their message out to voters, and published a set of letters from candidates. Once again, they've published it online as one huge file, but County Legislature candidates Martha Robertson and W. David Restey have a letter each in there. I missed covering last week's Dryden Courier, and there are only a few days left to get the current issue. I've chosen some especially unfortunate issues to cover late. If you want to get a feel for all the candidates up for election Tuesday, I strongly recommend getting this week's Dryden Courier. It includes answers to a questionnaire from Legislative candidates Athena Kalandros (9), Duane "Tyke" Randall (9), W. David Restey (13), Martha Robertson (13), Mike Hattery (14), and Mike Lane (14), as well as Town Board candidates Paul Lutwak, Steve Stelick, Mary Ann Sumner, and Daniel Tier. Both issues have cover stories on activities at the Dryden schools. The older issue (October 26th) visits the Dryden Middle School performing Joseph and the Technicolor Dreamcoat , and looks at steps the district is taking to try to address a $50,000 deficit on their school lunch program. The newer issue (November 2nd) looks at after-school programs for teenagers held at Cassavant Elementary School in McLean, and at Dryden Elementary students' participation in designing a floor for the school foyer. The older issue's editorial remarks on the changing weather, which has gone from brief snow to warm and sunny to the thunderstorm outside right now. There's also a letter from Ian and Melissa Garrett thanking County Legislator Martha Robertson for her work on a speed-limit reduction in Bethel Grove. In this week's paper, Managing Editor Steven J. Ferrari encourages readers to "Vote for the Person, Not the Party,". Letter writers include Steve Bissen writing to support Paul Lutwak, William Blackwell upset at Republican candidates for campaigning only on the east side of town. There's also a letter from me pointing that stereotypes of Republicans being more fiscally conservative than Democrats simply aren't true. The older paper reports on the freezing of the Village of Dryden budget, in response to increasing gasoline costs, and covers residents' concerns about a crosswalk on Route 392 (East Main Street) near Dryden Elementary where more notice might help keep children safe. In Anecdotes and Brevities, Harry Weldon contemplates the F.H. Fox bridge. The newer paper reports on a college prep seminar held for high school students at TC3 last week, in which the students themselves had to plan the seminar. In sports, the older paper reports on the Dryden girls soccer team winning the IAC championship for the third time in four years, and has a group photo of the Dryden girls swim team. The newer paper reports on Lansing's defeat of the previously undefeated girls soccer team in a sectional playoff game, with photos of Dryden players Anna Whitmore, Amy LaLonde, Stacey Riker, and Paige Davis. They also have group photos of the Dryden football and volleyball teams. I've enjoyed this year's relatively quiet Town Board race, and I think voters have an opportunity for change for the better this year. Mary Ann Sumner and Paul Lutwak both bring financial skills and a focus on doing a lot with a little. 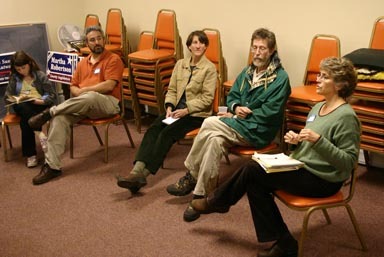 Mary Ann's experience at the Hanger Theatre and time spent working with finance give her an affinity for numbers I think will be very useful on the Town Board, while Paul Lutwak enjoys finding ways to make things work at low cost in his work for the Newfield schools. Mary Ann Sumner and Paul Lutwak. Both of them seem likely to continue local Democrats' tradition of fiscal prudence while helping the town deal with the challenges of growth, planning, and the upcoming construction of a new Town Hall. 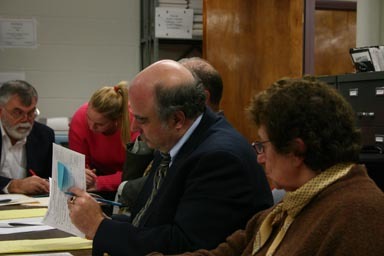 Paul is a member of the town Zoning Board of Appeals, while Mary Ann has been attending Town Board, Planning Board, and Conservation Board meetings, including the recent budget hearing. You can read her perspectives, if you'd like more detail. Paul and Mary Ann would also bring some different geographic perspectives to the board, which will otherwise be completely dominated by the eastern third of town. Paul lives on Midline, slightly further west, while Mary Ann lives on Neimi Road, bringing more of a West Dryden perspective. Both seem interested in the issues of neighborhoods all over the town. If you're interested in questions like how much money the town has in its reserves, how best to build the Town Hall and what to do with its extra land, or how the town's Comprehensive Plan gets implemented, I recommend voting for Paul Lutwak and Mary Ann Sumner. Not only will they manage these questions well, but they'll seek out and listen to public opinion. County Legislator Martha Robertson has brought tremendous energy to her job, whether she's speaking at a Town Board meeting, collecting information from constituents to improve road safety, or developing new ideas for lowering the cost of healthcare in Tompkins County. I've wished for a long time that I had nearly her energy level, and I'd like to see her returned to office tomorrow. 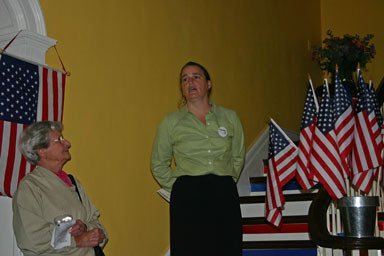 County Legislator Martha Robertson (right) talks about TompkinsRx. Martha doesn't seem like the kind of legislator who should be fiscally conservative - she has lots of projects she'd like to get done. Despite all of those projects, however, the tabulation of last year's budget votes shows her as #10 of 15 on the spending list, making her tighter-fisted than her Republican colleagues. One of her larger achievements, the TompkinsRx card that gets residents discounts on prescription drugs, cost the county nothing. Martha is passionate about her work - there's no doubt about that. She understands the value of county government and the possibilities that working together on that scale allows. She also watches the interactions between different levels of government closely. Looking toward the local level, she worked hard on keeping the Recreation Partnership going. Looking toward state issues, she lobbied state government (along with legislators from a broad coalition of counties) when it was clear that the state government's effort to shift costs to the counties was driving property taxes inexorably upward. She worked as part of a group that got results, as the "soft cap" on Medicaid's impact on this year's county budget and the previous budget demonstrate. I'm especially interested in her work on traffic issues. She's been pushing on the prospect of a park-and-ride near the 13/366 intersection, and has also become very familiar with the state Department of Transportation's rules for speed limits, helping lower the limit on Route 79 through Bethel Grove from 55 to 45mph. Natan Huffman, Chief of the Varna Volunteer Fire Company, spoke highly of her work on adding new signage to the intersection of Ellis Hollow, Turkey Hill, and Quarry Roads. Martha's combination of energy and attention to detail would be very hard to replace. Keep Martha Robertson working for us. Tomorrow we have a choice among candidates for District Attorney, and I'm delighted with Gwen Wilkinson. She wants to ensure that violent criminals of all kinds are prosecuted, and that even difficult cases get a close look. I like what I've heard about improving the efficiency of the DA's office, especially when I look at statistics about how Tompkins County's conviction rate compares to other counties. Wilkinson offers Tompkins County a chance to take much better advantage of drug court, a development that seem to be treated as ordinary most places, except in her opponent's writings. Her emphasis on breaking the cycles that cost our county tremendously - in victims, in jail costs, and in prosecution costs - makes much better sense to me than sending small-time criminals to prison to learn how to become better criminals, without addressing what brought them to crime. Wilkinson also seems to have a much clearer understanding of what last year's modifications of the Rockefeller Drug Laws accomplished. It's also worth noting that running for office after years as a Department of Social Services lawyer is difficult. The cases are complicated and filled with heartbreak of all kinds, there's no public celebration of a victory, and you can't talk about what's happened, for good or bad. That's not a great jumpstart for a political career, and Wilkinson seems to me to have played by the rules of that job even where it meant she couldn't answer pointed questions. Wilkinson's dedication to fighting crime has impressed me. I think Tompkins County has a chance to modernize its District Attorney's office, to come into the mainstream of crime-fighting approaches in New York State, to lower the cost of crime-fighting and to prosecute crime more effectively than it is today. Voting for Gwen Wilkinson tomorrow is a key first step. Note that polling places for districts 10 and 11 have changed. Polls are open from 6:00am to 9:00pm. If you're not sure what district you're in, see the district map (597KB PDF). 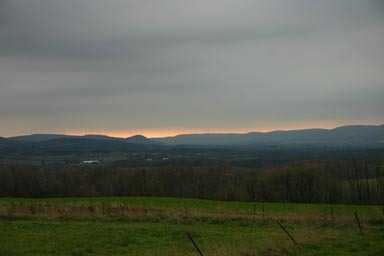 I was out at Malloryville and Peruville Roads this morning when I looked to the south and saw a lovely glow over Dryden. The photo doesn't quite capture it, but you might get the idea. I've published the polling places list for Dryden if you need to find out where you need to go. Last night was a night of ups and downs. It looks like Dryden will once again have a Democratic member of the Town Board, as Steve Stelick (R) and Mary Ann Sumner (D) led the field. Our numbers last night showed County Legislator Mike Lane (D) up by 10, but the Board of Elections currently shows challenger Mike Hattery (R) up by 41. A check of tally sheets and absentee ballots will be held this afternoon, as this is well within the number of absentee ballots. County Legislator Martha Robertson (D) defeated challenger Dave Restey (R) by better than a 2-1 margin. I'm hoping that the count we had last night for Mike Lane was right and the Board of Elections is reporting a transcription error, but the odds don't likely favor that. We'll see today what the effective results are, and maybe Mike Lane can still pull out a victory. Today's Journal notices the November 8th election. The "Wilkinson wins DA race" across the top is hard to miss, as is the picture of County Legislator Martha Robertson congratulating Gwen Wilkinson, who defeated incumbent District Attorney George Dentes by a preliminary count of 10,947 to 9,099. They credit Robertson with a clear win over W. David Restey, but leave County Legislature District 14 unknown, with Mike Hattery leading County Legislator Mike Lane 842-801 as we head into the absentee ballots. 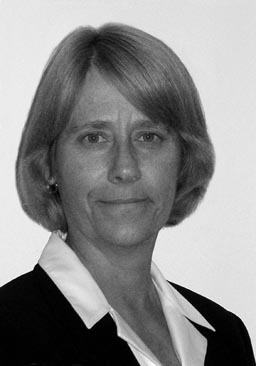 The Journal has articles on the DA's race, county legislative races, and Town races, noting the addition of a Democrat, Mary Ann Sumner, to the Dryden Town Board. There's also an article on election meals, complete with a photo from last night's tasty chicken dinner at Dryden United Methodist Church. In other Dryden news, Cathy Wakeman's Dryden Town Talk visits the Fortnightly Club exhibit at the Dryden History House, and notes that illusionist Toby Travis will be performing at the Reach Out for Christ Church tonight at 7:00pm. A pancake breakfast Sunday at the Varna Community Center (map) from 8:00am to noon. It'll be $6 for adults, $5 for seniors, and $4 for children. They have pancakes, french toast, fruit, eggs, cakes, bacon, ham, and potatoes. The Dryden Town Historical Society will have a presentation on historical markers, "Signs by the Side of the Road," on November 16th at 7:30pm at the Dryden Village Hall (map). Most people don't have a chance to read historic markers while they drive by, and this is a great chance to catch up. The McLean Post Office is accepting donations for a "Share the Warmth" winter coat giveaway. The coats (and outdoor clothing) will be available for pickup on Saturday from noon to 3:00pm at the McLean Fire Station. There will be a free forum on senior services on Thursday, January 12th, at the Dryden Fire Hall (map). The TC3 Alumni Association is taking a trip to New York City on December 3rd, and the public can join the excursion for $40. They'll leave at 6:30am, and leave New York at 7:30pm. In state news, one ballot proposition passed and another was defeated. The budget process amendment fell, while the transportation bond act passed. On the opinion page, the editorial reflects on the passing of the lever voting machines and what will replace them, and Maureen Brull of Dryden contrasts Republicans' current unwillingness to investigate scandals with their eagerness when Bill Clinton was in office. Last night, I thought Mike Lane was ahead of Mike Hattery by 10 votes. This morning, the Board of Elections reported Hattery ahead by 41. When I arrived at the Board this afternoon, the difference had changed to 36, as a 9 on the tally sheet had been read as a 4. The next three hours were a long process of checking the reporting sheets, examining (and sometimes challenging) absentee and affidavit ballots. 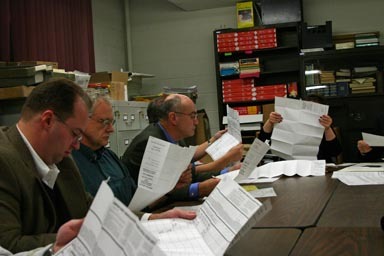 Mike Lane inspects an affidavit ballot as Irene Stein looks on. I saw an amazing number of split tickets - Mike Lane has clearly done well at convincing Republicans to vote for him regardless of party. The absentee ballots are a very different experience from the simple tallies, as you can see the patterns in people's voting, instead of just the totals. At the end of this process, Hattery led 865-845, his lead reduced to 20 votes. There are still 19 ballots that could arrive by mail, including some military ballots, which can arrive by as late as the 21st. There were also 11 challenged ballots - I remember, though I'm not certain, that the Republicans challenged 8 and the Democrats 3. I've posted a gallery of photos of this strange event. Sitting across from the Republicans led to a lot of photos of Republicans, leaving out another five or six Democrats and the WHCU reporter. There's also a picture at the end showing what the machine tallies looked like, for the last election using these machines. Sadly the page I shot is all zeros! We'll see what happens. Close races are one aspect of politics I can't say is enjoyable. This morning's Journal reports on the dwindling of Mike Hattery's lead over Mike Lane to 20 votes in the District 14 legislative contest, with 30 possible ballots still out there. "[A snowmobile safety course] taught me all the signs on the trail for oncoming snowmobiles... Like the stop, like when you're riding with someone else, you hold up your fingers to show how many people are behind you. It tells you the safety features and not to follow too closely and to stay on the right side of a trail when going over a hill." The article also mentions the Dryden-Caroline Drifters snowmobile club, which will be meeting on December 3rd at the Dryden VFW. A surge of pet adoptions has eased overcrowding at the Tompkins County SPCA on Hanshaw Road, but it still sounds like they have lots of dogs and cats who would could use permanent homes. An article on the SUNY budget increase includes a sidebar on ways this could help TC3's budget. Finally, only three people showed up at last night's county budget hearing. After all the shouting about spending and taxes during the election, I have to say that's surprising and even disappointing. Amidst all the political news, political institutions still operate as usual. The Dryden Town Board will be meeting tonight at 7:00pm at the Dryden Town Hall (map). The agenda doesn't appear to be posted on the town site, but I've put up a PDF version of the agenda (68KB). I'm especially curious about what they'll be saying about Japanese Knotweed, Ellis Hollow water, and also about the Dryden-Freeville trail. One of the problems with writing this blog is that I frequently have to write on news that saddens me. Tonight is definitely one of those times. County Legislator Mike Lane conceded the District 14 election to Town Board member Mike Hattery tonight at the Town Board meeting. Mike Lane and Mike Hattery shake hands after Lane's concession. I've posted Lane's concession statement (54KB PDF; 91 KB selectable), and Hattery thanked Lane for his years of public service afterward. This morning's Ithaca Journal has a lot from last night's Town Board meeting, with an article on Mike Lane's concession speech and another piece on possible development north of the Village of Dryden near TC3. One plan, proposed by Bill Wilbern, would include a possible Best Western motel, while the other would move (and expand) a large engineering firm, Advanced Design Consulting, from Lansing to Dryden. Water and sewer would be a large issue for the motel development, but isn't as critical to Advanced Design. The Town Board also discussed spending $4000 on an aid application for Advanced Design. The board seemed supportive, but wanted some further conversations before moving ahead. The article also mentions the preliminary Dryden-Freeville trail plan, which would now likely go only from the Jim Schug trail's end in Dryden to Springhouse Road. I've posted the text of the report (4054KB PDF) and the first map (6255KB PDF), but these are enormous because of the scans. I asked last night that the town post this on their website in a more concise form, and I'll report when it's available as a smaller (and more complete) download. There's also a letter from Stanley Marcus of Freeville, encouraging the County Legislature to board prisoners in the jail, repair roads earlier with hot asphalt, cut back on TC3, and stop supporting the Tompkins County airport. 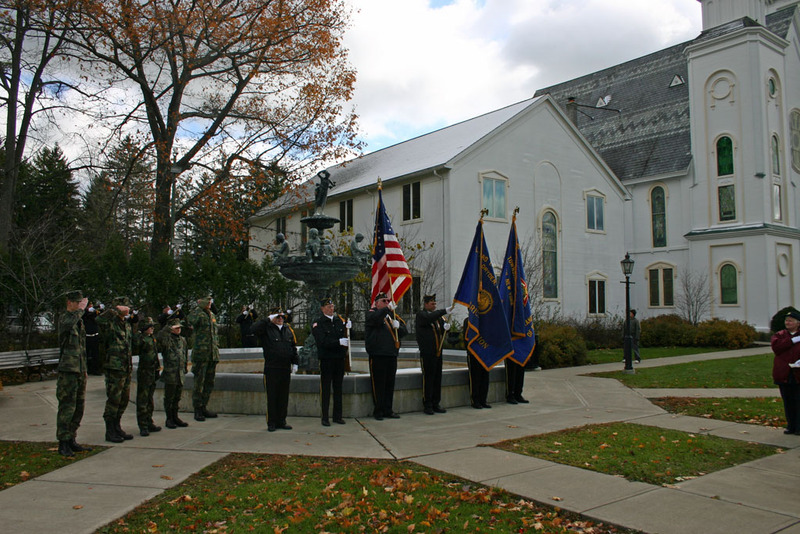 The Dryden Veterans Memorial Home held its annual observance of Veterans' Day this morning at 11:00am on the Village Green in Dryden. The event include an introduction, a flag-raising, a prayer, a reading of the Journal's editorial on Veterans' Day, a benediction, and a salute followed by Taps. I've posted a gallery of photos if you'd like to see more. Rob Garrity came up and climbed to my roof, though he couldn't go up on it because my roof also needs replacement. 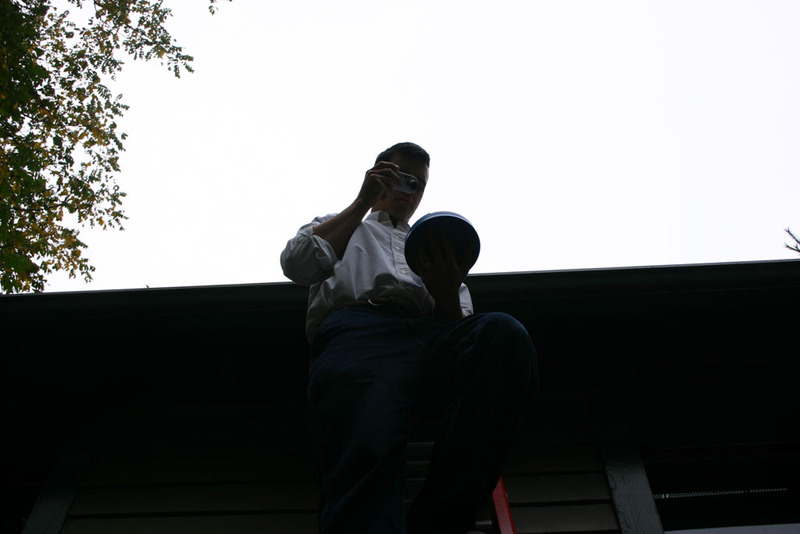 Rob Garrity prepares to ascend with Solar Pathfinder. Collecting reflection data with the Solar Pathfinder. Unfortunately, the report (52KB PDF or 68KB selectable) came back negative, even for the gentler requirements of solar hot water. I knew I had two box elders in the way and a butternut tree with some limbs over the roof, but the larger problem seems to be the birches up the hill, and perhaps the hill itself. Since the solar doesn't seem likely to work out in the near future, I'll probably go with an on-demand natural gas water heater. "This is the first time I've ever done a turkey shoot," said Sills, a licensed hunter. "The pie plate is all I've been doing. I've been close, very close, but my husband has gotten five of them (turkeys)." Sills said she was surprised she hadn't seen more women participating in the event. "It's not something women physically can't achieve," she said. "It's absolutely possible. I really don't have an explanation for it. Maybe it's something they tried and didn't enjoy it. I've seen some wives out here as spectators." There's also an article reviewing the Town of Dryden budget that was approved last month, noting the 0.7% spending decrease that left the town with a 4.8% property tax levy increase. It also talks briefly about the $25,000 budgeted for community center improvements. I've been switching my weather links from the advertising-dominated and information-light weather.com to the advertising-supported but information-heavy Weather Underground. I noticed this morning that they have a section of photos uploaded by visitors, and you can check out Dryden photos in particular if you like. This week's Dryden Courier leads with a look at the prospects for a new Town Hall, which Town Supervisor Steve Trumbull says will probably cost around $2 million, up from estimates long long ago when they started saving of $300,000. (Fortunately, reserves have kept up.) The old Town Hall's offices are crammed, and it has only one meeting space, creating conflicts with the court's schedule. He also said all the adjacent land is going to eventually give the town the opportunity to create more recreational space: more fields for both kids and adults to use. "You know, we don't actually have a lot of land for use for children and adults," he said. "We've got ball fields over at the high school but everybody wants to use them. I'd like to see more soccer fields, maybe a lacrosse field, and there's room for that right on this new property." "We had all this money and it was just sitting there," Trumbull said. "At some point you've got to something with it. It's just been sitting there because everyone was doing business as usual, and never took a chance. I think once in a while you've got to take a chance." Elsewhere in the paper, they explore the added costs that No Child Left Behind will leave behind with area school districts, and note that Dryden National Junior Honor Society students will be going to a national conference in Washington, DC in June. In sports, columnist Paul Gangorossa notes that Dryden High School hosted a lacrosse tournament despite not having a lacrosse program, and thinks it would be a good addition. There's also a mysterious entry on the Dryden Purple Lions falling to Corning East (where I went to high school) in the Class B finals 25-11, 22-25, 25-1. It just doesn't specify which sport, though it's clearly girls playing. This week's Dryden Courier also mentions Wednesday night's Dryden Town Historical Society program, Signs by the Side of the Road , to be held at 7:30pm at the Dryden Village Hall (map). I've always marveled at historic markers, which attempt to tell stories in a short space as cars pass by rapidly. 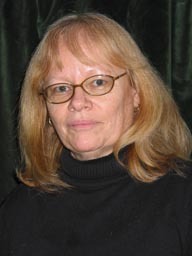 Marilyn Adriance will be speaking not only about what the signs in Dryden say, but what we know about how they got there and sometimes about how they disappeared or moved! IDA Chairman and County Legislator Michael Lane requested a breakdown of financial assumptions and projections by the project's components, such as a 35,500-square-foot movie theater, 46,450 square feet of retail space, and 47,300 square feet of residential space. The Journal's editorial notes that state law now requires that projects within 500 feet of a municipal boundary include neighbors in hearing processes (for special permits, subdivisions, and site plan review, not your average house). Dryden's boundary areas are largely empty, except for houses. It does remind me of Ellis Hollow Road residents' objections to the Burger King in East Hill Plaza, but this wouldn't have affected that as the Burger King is much further than 500 feet from the line. Arthur Barry of Dryden writes that "Only the voices of the living are being heard in [the abortion] debate." As gas prices have lurched around and my loyal 1996 Saturn's odometer has clicked past 162,000 miles, I've been thinking a lot about what I'd like my next vehicle to be. Unfortunately, it doesn't exist, though I'm pretty certain all the parts for it exist. I'd really like a small pickup truck with the slightly extended cab (for my two reasonably small dogs). I'd also like a hybrid, so that I can put the energy I waste going down the hill into Ithaca or stopping at a traffic light back into my car when I want to accelerate, instead of it just burning off into the air as heat from the brakes. I'd like a diesel, for their generally high efficiency. Driving around Dryden is a mix of city and country, and the pickup bed would definitely be helpful for political chores like collecting signs after an election, as well as various construction tasks on my house, hauling lumber, and generally moving things around. Maybe someday. In the meantime, I'll hope the Saturn holds up. Finally, the Legislature approved having the Tompkins County Industrial Development Agency issue up to $7 million in tax-exempt bonds for the Tompkins Cortland Community College Foundation Inc. housing project that is expected to break ground next year. The Legislature did debate at length whether to support the bond deal because the Foundation will not pay a prevailing wage on the housing project that will house students when finished. Local union leaders said they are not in favor of the Foundation not paying a prevailing, or living, wage for the project. But they have been told there will be work for union workers on the project and on other TC3-related projects. That resolution passed by a 9-6 vote. but it doesn't specify who voted for or against it. Briefly in Dryden reports on a gift box drive for soldiers sponsored by Dryden Veterans Memorial Home. They'll accept completed gift boxes or cash donations. The TC3 Alumni Association is taking a trip to New York City on December 3rd, and the public can join the excursion for $40. They'll leave at 6:30am, and leave New York at 7:30pm. Finally, TC3 will be is looking for community members to talk with about "what the college does well and what people would like to see from the college in the future." There's also an article on proposed changes to school start times in the Ithaca City School District. Citing new responsibilities as Ithaca deputy police chief, Dryden school board member John Curatolo resigned from the board Monday night. Curatolo has been on the board for five and a half years. The board has 90 days to appoint someone to fill the position. Forget politics or sacred cows. All new ideas must be entertained. All old programs and services must be carefully reviewed. Something must be done, soon, or there will be too little left for too few of us to resurrect when the great Empire State tax war is done. Unfortunately, saying property taxes need to come down doesn't make them come down. It reminds me too much of Republican claims in the last election that fresh eyes on the budget would be able to find savings that no one's found so far. Talking about specific changes is guaranteed to annoy people, but that's the conversation we need to have, rather than praying for deliverance from taxes. 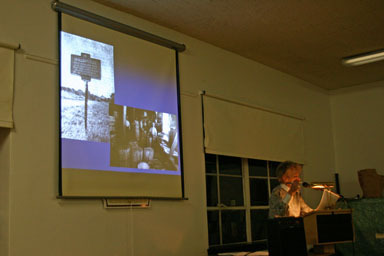 Marilyn Adriance explained the historical markers of the Town of Dryden to an appreciative audience at Village Hall last night, in a program presented by the Dryden Town Historical Society. Adriance had a table of documents and information, as well as a handout with the text of the state signs (58KB PDF or 104KB selectable). The handout made it easy to follow along, and gave attendees a reminder of what they'd seen. 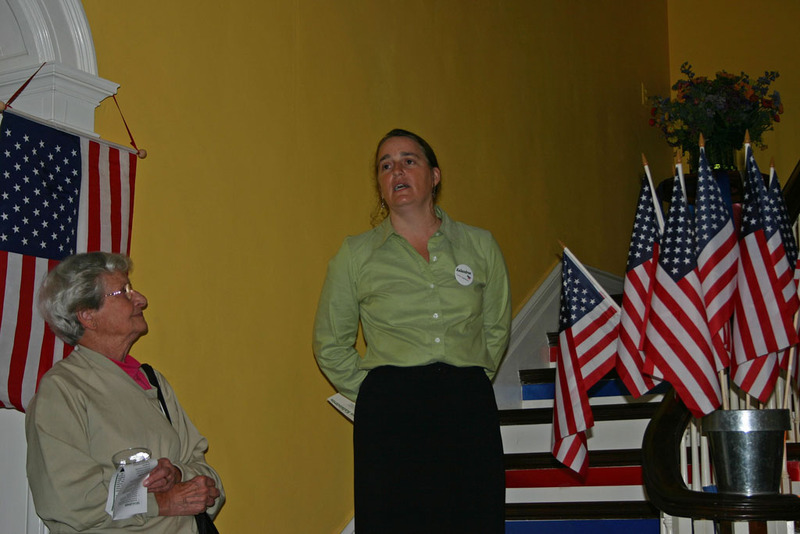 Marilyn Adriance talks about Malloryville's past. Adriance started with the history of the roadside marker program, when the state started celebrating the 150th anniversary of the Declaration of Independence by posting markers. Markers cost communities $2.00, and the state picked up the rest until 1939. The state Department of Education stayed involved through the 1960s, but now the state just does the oversized markers at Thruway rest areas and similar places. Want to put up a marker today? It's around $700. Most of the markers Adriance discussed were put up by the state in that early period, though some have moved or disappeared. 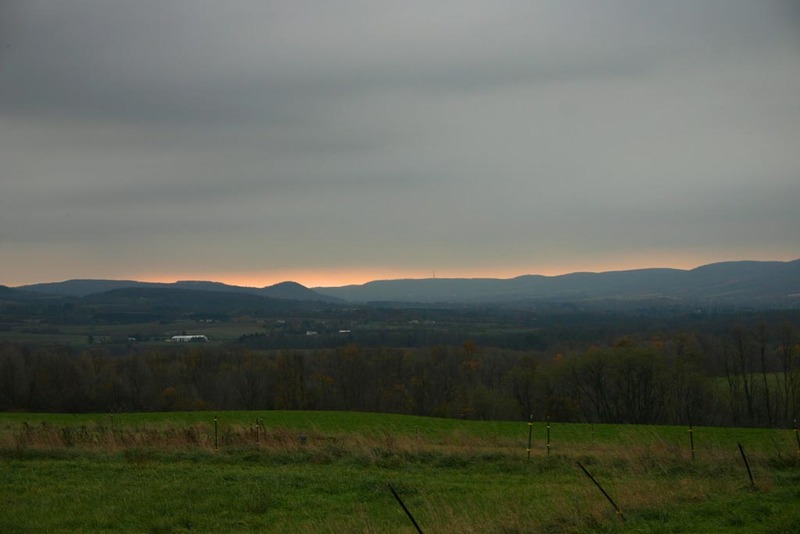 She explored the Underground Railroad markers in the Etna area on Lower Creek, and then the various signs about the Bridle Road or First Road, cut from Oxford across to Ithaca (after a detour through Ludlowville) in 1792-5. Adriance also talked about the Malloryville signs, one of which is still there, the John McGraw and John Miller signs on Irish Settlement, the signs for "Daddy" George near Asbury Road, the Baptist Church sign at Etna Community Church, the Indian Camp sign at Dryden (no longer near the camp!) and a sign listed as Dryden but just across the line in Peruville, about Charles Sanders, an early writer of textbooks. Adriance also talked about the sign for the historic district in the Village of Dryden. She'd been trying to track down when it went up, and the Village had some records from 1992. County Legislator Mike Lane and Gina Prentiss confirmed the date and told the story of applying for grants and posting the sign. If you missed it, the transcript will be at the History House in a few weeks, so you can still stop in and learn. In late October, the staff at the Tompkins County Society for the Prevention of Cruelty to Animals was tested by what it called a "perfect storm." The nationally renowned no-kill shelter in Dryden did some good charity work to aid animals displaced by Hurricane Katrina. But that began to tax the shelter's limits. Then, a local animal-cruelty investigation led to the seizure of many animals, and combined with an unexpected spike in the number of cats surrendered, the SPCA's pet population swelled beyond its practical limits. Warm-hearted liberals and compassionate conservatives alike in Tompkins answered the call. From Oct. 26 to Nov. 8, good, long-term homes were found for 69 cats and 18 dogs, according to new SPCA Executive Director Jeff Lydon. The surge in adoptions may well have set a record at the shelter, Lydon said, and it swiftly helped reduce the animal population to manageable levels and alleviated overcrowded conditions. Dryden residents in the Ithaca School District may also be interested in a story on a possible February referendum about additional taxes to support the Tompkins County Public Library. This morning's Briefly in Tompkins notes an 8-ton weight restriction on the Etna Lane bridge over Fall Creek. They also list a free Thanksgiving Day dinner to be held at 1:00pm November 24th at the Freeville United Methodist Church, for which an RSVP is required. There's also an article on the Cornell transportation study, which is primarily a joint effort of the Town of Ithaca and Cornell, but in which Dryden is also participating. The article notes both commuter issues in Ellis Hollow and studies for park and rides. Dryden stays quietly out of the Ithaca Journal this morning, but Briefly in Tompkins has two items worth highlighting. There will be a December 14th workshop on winterizing old windows at Cooperative Extension 615 Willow Ave (map) at 7:00pm. Registration is required. I've done some window work, but plan to do a lot more. The Tompkins County Office for the Aging and Lifelong are looking for volunteers to shovel sidewalks for senior citizens. Call 274-5482 or 273-1511 to volunteer. We may be seeing our first widespread snow tonight. This morning's Journal talks about drivers getting ready for winter to avoid accidents, and the print edition includes a map of dangerous roads. In Dryden, those include Route 34B, Turkey Hill Road, Irish Settlement Road, North Road, Ferguson Road, and Route 38 south of the Village of Dryden. The editorial turns a skeptical eye to the library tax district proposed for the Ithaca City School District. The print edition also has a letter from Charlie Hart of Ithaca, and makes me wonder if one of the two Charlie Harts, the one from Freeville, has moved to Ithaca. In state news, candidate for governor Eliot Spitzer has committed himself to ending gerrymandering in New York State, the reform I consider most important of all to giving New York State a government we can be proud of. This morning's Ithaca Journal reports that complications involving wetlands at the proposed Town Hall site are likely to delay construction. The town has already worked around the largest wetland, but other patches in the property are causing problems. Environmental Planner Dan Kwasnowski hopes to address the issues and also incorporate them into a stormwater management plan. Cathy Wakeman's Dryden Town Talk reports on the plans for the Victorian Winter Festival, which will expand to two days, December 2nd and 3rd, this year. On the 2nd, businesses will have an open house from 3:00pm to 7:00pm, including a craft fair at the Candlelight Inn. Music will start at the Village Green at 5:00pm, leading to the tree-lighting at 7:00pm with Santa and Mrs. Claus. Saturday will have Horse and Wagon history tours presented by the Dryden Town Historical Society, as well as Santa's Workshop at Dryden Elementary and a reception at Neptune Hose Company from 2:00pm to 4:00pm. Wakeman also notes tomorrow's Thanksgiving dinner at the Freeville United Methodist Church. Briefly in Dryden is only in the print edition, noting the Dryden Veterans Memorial Home's military gift box project and the TC3 alumni group's upcoming New York City trip December 3rd. There's some mildly good news about natural gas supplies and prices in New York State as we head into winter. I started to report on this week's Dryden Courier when I realized that I hadn't yet reported on the previous week's issue (November 16th), so thought I should do that first. The Courier led with an article on custodian Dave Davis' 35-year tenure at Dryden Central Schools, making him the most senior employee. He praises the schools as "a great place to work," and hasn't yet decided when he's retiring. There's also a report on possibilities for development north of the Village of Dryden, with Elizabeth Rinaldo reporting on the possibilities for a Best Western hotel and a Dollar General north of the A-1 restaurant as well as Advanced Design Consulting's possible move there. What Mike Lane did Thursday night is not unheard of, but unusual. He put the needs and desires of his district before his own. He voluntarily stepped down to ensure that his neighbors and friends would not have to endure a long, contentious post election process. And he did it before he was forced to, before all the votes were counted. He relied on his logic and not on his heart. Mike Lane showed his true colors, and the colors that were revealed were honest and true. There's also an article looking at safety procedures in the Dryden and Groton school districts, and Harry Weldon writes about Indian activity in the Dryden Lake area. In sports, Julie Faber of Dryden was named to the 2005 Finger Lakes Newspapers Girls Volleyball All-Stars, while Abinye Smith was named to the Football All-Stars. This morning's Journal publishes an update to a September story about Rona King's move to Dryden after Hurricane Katrina. After three months at the Ringwood Road house of Linda Lavine, King is heading back to New Orleans and a still uncertain future. Ellis Hollow resident Robin Schwartz, Program Director of the Community Arts Partnership, is quoted in an article about the Holiday Artists' Market. Briefly in Tompkins reports on TC3's efforts to survey students, staff, and alumni, including a web site collecting ideas for the college. On the opinion page, Paula Thoma, principal of the Freeville and Cassavant elementary schools, thanks the Dryden schools for supporting her recent trip to Japan, and offers to share what she learned. The November 23rd Dryden Courier has a story that hopefully won't be repeated: Village of Dryden Police responded to a 911 call on Lee Road, and no one answered. 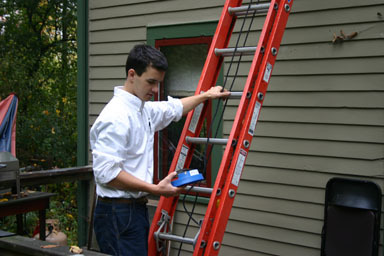 In making sure there wasn't a problem there, they caused $700 of damage to the door. The problem wasn't a silent criminal, however - it was that the 911 call center had the wrong address, and the accidental call came from an elevator at TC3. The Courier has a lot more detail on how this happened and who may in the end have to pay for that door. This kind of problem could have been a lot worse, though it still sounds like a huge headache. They also have an article on James Barber, an Army Reserve drill sergeant from Dryden who just returned from a year in Iraq spent training the Iraqi Army. Barber, happy to return to his two-year-old daughter, says his trainees were "just...the best soldier unit." 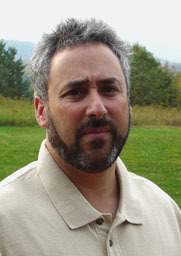 There's also some Dryden schools news, with a report on John Curatolo's retirement from the Dryden School Board to focus on his new Ithaca Police duties. Dryden Transportation Supervisor David Fuller showed the board the impact of higher fuel prices, and called for a four-day school week in the future to reduce the costs of transportation and heating. The Courier has a photo of the Dryden schools' Thanksgiving food drive as well. For readers in the Ithaca school district, there's an article on the proposed Tompkins County Public Library referendum to raise $540,000 in tax funding from residents of the school district. There's a listing of local residents who became TC3 Phi Theta Kappa Honor Society members, as well as results from the BOCES senior Cosmetology Competition, with pictures of Dryden competitors. In sports, it's time to name all-star teams. Paul Gangarossa lists the players for the Ernie Davis Exceptional Seniors All-Star football game, including Abinye Smith, Cory Hollenbeck, Matt Outen, and James Miller of Dryden. The 2005 Finger Lakes Newspapers Girls Soccer All-Stars include Jess Bush and Stacy Riker of Dryden, and the Boys Soccer All-Stars include Kyle Clapper and Jordan Minnis.